A blend of Beeswax, carnauba wax amongst other waxes and colouring agents dispersed in solvents. 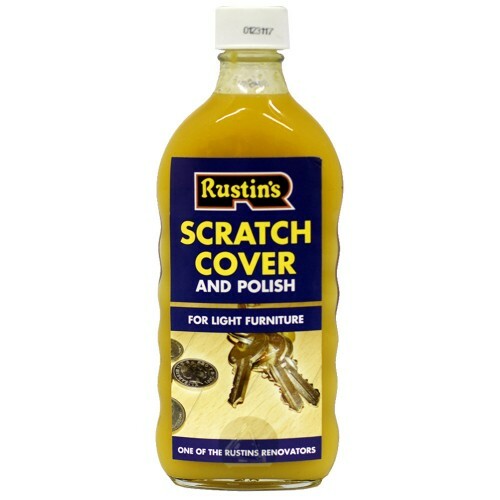 Rustins Scratch Cover is for new and old furniture. It polishes and masks unsightly surface scratches. Manufactured in two shades- one for light furniture and one for medium to dark furniture. For best results clean surface with Rustin’s Surface Cleaner to remove any wax polish that may have been applied. Apply the scratch cover to the scratches with a soft cloth and leave for several minutes before rubbing with a clean soft cloth. When the scratch has been masked apply the scratch cover over all the surface and polish off with a soft cloth or duster. If the finish is very badly scratched it should be treated with Rustin’s Finish Reviver. Several application may be required if the scratch is deep. Application Temperature: Ideally 15-25°C. Do not use below 5°C, or in conditions of high humidity. 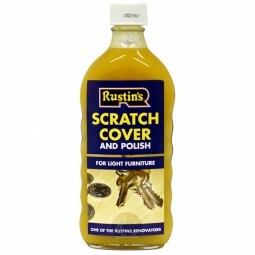 Rustins Scratch Cover can be used on painted varnished or stained surfaces. Please be aware that when stained, colour may vary from surrounding wood. Shake thoroughly before use, ensuring the container is tightly closed. The shelf life of the product in an airtight container is indefinite when stored in a cool dry place. It is important to replace the lid and ensure an airtight seal. Keep away from all sources of ignition- No smoking.